Kieran Cadogan’s late goal meant AFC Fylde had to settle for a 2-2 draw when they met Sutton United at Mill Farm. 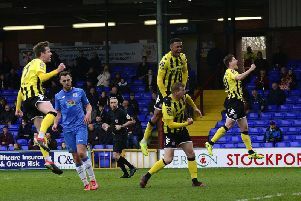 Gime Toure’s 81st minute strike had put the Coasters ahead for the second time before Cadogan’s effort seven minutes later meant it was a point apiece. The Coasters made one change as Arthur Gnahoua had done enough to impress his manager following his goal at Hartlepool in the week. The opening exchanges had the lively Nick Haughton seeing plenty of the ball and, in the 19th minute, he drew in the defender before whipping a delightful effort across goal. It was palmed away by Jamie Butler into the path of Andy Bond, whose first-time effort somehow evaded the target from close range. Five minutes later and, after good work from Zaine Francis-Angol, Danny Philliskirk’s blocked effort fell to Bond, who was denied by the onrushing keeper. It took until the 36th minute for the deadlock to be broken, in part thanks to Haughton’s resilient work. His incisive breakaway eventually saw the ball drop into Bond’s path and he powered it past Butler to put the Coasters ahead. This allowed Fylde to play with more freedom as Ryan Croasdale fired a powerful effort just wide. Haughton was at the heart of the Coasters’ next key chance when a wonderful effort from distance thundered off the bar and back into play. The second half saw a resurgent Sutton side emerge, with Brandon Thomas-Asante spearheading attacks from the early stages. Wayne Brown was the first to test the Coasters’ defence after the break, his long range effort working Jay Lynch early on. The keeper was equal to Craig Eastmond’s low, curling effort just before the hour mark with Thomas-Asante’s rebound going harmlessly over. In the 74th minute, however, Sutton’s first team debutant Bradley Pearce levelled with a tidy finish. A short corner played into Josh Taylor wasn’t dealt with and it bounced into Pearce’s path, the academy graduate catching the ball sweetly and nestling it into the corner. Sutton could have taken the lead almost instantly, as Burke’s underhit backpass played in the prowling Thomas-Asante. However, Lynch was quickly off his line and did enough to force his effort wide. The Sutton bench appealed for a penalty, given the strong nature of his save, but referee Martin Woods was not convinced. This acted as something of a wake-up call for the home side and an inspired move from substitute Toure saw him glide in from the left wing, before curling the ball beyond Butler. The Coasters weren’t able to hold on to the lead after Sutton also brought on a replacement who would make a decisive contribution. Jamie Collins’ long ball into the box was headed by Aswad Thomas into the path of Cadogan, who caught the ball sweetly and finished astutely, sending the travelling fans into a deafening roar. Ashley Hemmings came off the bench for the Coasters and tried to take on the full visiting team late in added time but Sutton remained resolute. Sutton United: Butler, Thomas, Clough, Collins, Davis (Beautyman 80), Eastmond, Bailey, Brown (Cadogan 86), Pearce, Taylor, Thomas-Asante (McQueen 76). Subs not used: Worner, Dundas.